England coach Sven-Goran Eriksson says Wayne Rooney is the greatest teenage talent to emerge since Pele. 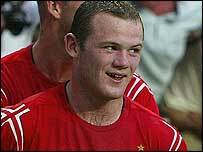 Rooney, 18, grabbed two goals as England beat Croatia 4-2 to make the last eight of Euro 2004. Eriksson said: "I don't remember anyone making such an impact on a tournament since Pele in the 1958 World Cup. "I don't really know what to say. He's absolutely fantastic, not only at scoring goals but he plays football - he's a complete footballer." Pele, widely regarded as the greatest footballer of all time, inspired Brazil to victory at the 1958 World Cup finals as a 17-year-old. England skipper David Beckham agreed with his coach's assessment of Rooney, who is now the tournament's top scorer with four goals. "I think he's probably right," he said. "It's a great compliment but I think he deserves it because of how he is performing. "If he carries on, then hopefully we'll go a long way in this tournament. "He's an amazing player, he's proving that to a lot of people over here. He doesn't have to prove it to us because we know what a great player he is. "He's doing it in each game and we're very happy to have him in our team." Eriksson added: "He deserves all the attention and all the front page headlines. I sometimes feel I shouldn't say too much but he has been absolutely incredible. "I don't need to tell him how to score goals. It is better I don't say anything, his vision is incredible, he's ready for anything." Rooney's close friend, England midfielder Steven Gerrard, also insisted the Everton striker is the best player in Europe and could inspire Eriksson's squad to their first European Championship win. "On current form, he is the best player in Europe," said the Liverpool captain. "His performances have been really mature. He holds the ball up well, brings people into play, and now he's getting important goals as well. "If you look at his performances over the last three games, he has definitely helped us get to the quarter-finals and I'm sure he'll help us progress even more. "Everything about his game is spot-on, and he can help us win the tournament."